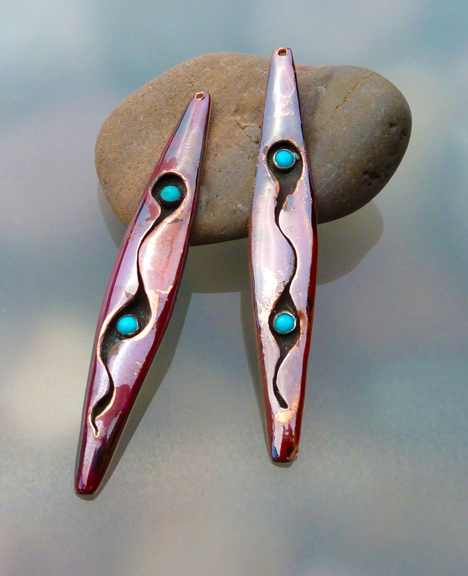 Dangling earrings of deep autumnal reds and golds set off turquoise in this hollow form shadow box design. High heat brings out the bright tones of the copper. Earrings are entirely hand-crafted. No two are alike. Approximately 2 inches long and half an inch wide at the broadest point. Signed on the back. These remind me of autumn leaves – just in time for the equinox! I love fall colors. Pictured without hooks. Hooks are sterling silver.